In July 1942, Anne Frank and her family fleeing the horrors of Nazi occupation, hid in the back of an Amsterdam warehouse. Anne was thirteen when the family went into the Secret Annexe, and over the next two years she vividly describes in her diary the frustrations of living in such confined quarters, the constant threat of discovery, hunger and tiredness, and, above all, the boredom. Her diary ends abruptly when she and her family were finally discovered by the Nazis in August 1944. 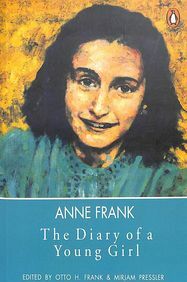 The author was born on 12 June 1929 and died while imprisoned at Bergen-Belsen, three months short of her sixteenth birthday. The book remains the single most poignant true-life story to emerge from the Second World War.